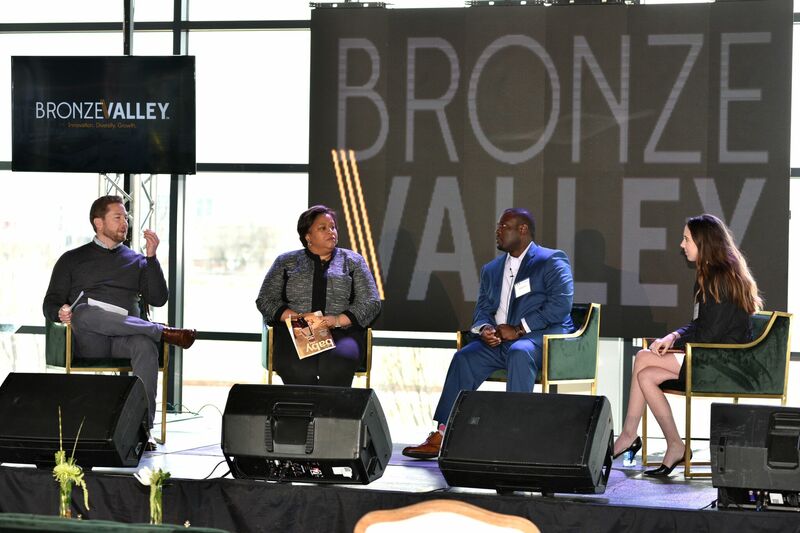 During Bronze Valley’s morning session on Feb. 14, Jared Weinstein, general partner with Thrive Capital, led a conversation with local entrepreneurs focusing on how they got started and lessons learned. Entrepreneurs on the panel included: Cecilia Pearson, founder and executive director of Babypalooza, Shegun Otulana, founder and CEO of TheraNest, and Taylor Wyatt, president of MotionMobs. “What was the moment you decided you would start this? What was the kernel?” Weinstein asked. Wyatt, who started MotionMobs eight years ago, was ahead of the curve with mobile applications. “At that time, the app had only been out for one year. I was in my last semester of college and was fascinated with how this technology could be used intentionally with business,” said Wyatt. When asked what lessons they learned along the way, all three quickly weighed in. “At the time I was wearing a lot of hats. I would tell myself to try to be more focused and to let go of more. It took me more time than I care to admit to have other people come on board. What I am most proud of is our team members and the relationship we have as a company. I wish I had been more intentional about building a team earlier,” said Wyatt. “I would have started the company with more capital,” added Pearson. “If I would have done it again, I would have hired a project manager,” commented Otulana. The conversation shifted to how each panelist would like to see Birmingham change in the tech and innovation sphere. “I am excited to see how much Birmingham has changed in eight years. There have been a lot of new resources such as Alabama Launchpad, REV Birmingham and Alabama Capital Network. However, we still have room for improvement. Being more inclusive is extremely important. There are so many different directions that can go. There is still a huge gap for people to find resources,” added Wyatt. How does tech play into the success of your companies? The panelists all agreed how important it was to keep up to speed with advances in technology for survival and growth. “You have to realize that people who are successful are the ones who are taking advantage of tech, if you don’t continue to change and stay relevant, you won’t make it. I know multiple companies who were not willing to change and now they don’t exist. If I stayed just with print, I would no longer exist, so I have to make a pivot to using technology to reach my audience,” commented Pearson. Culture is another area the panelists discussed. “Venture investments care about the culture. Talk about the culture each of you are trying to build and why it is important,” advised Otulana. The panel concluded with conversation around workforce development and how each entrepreneur is hopeful to see the momentum continue around the Birmingham startup culture.